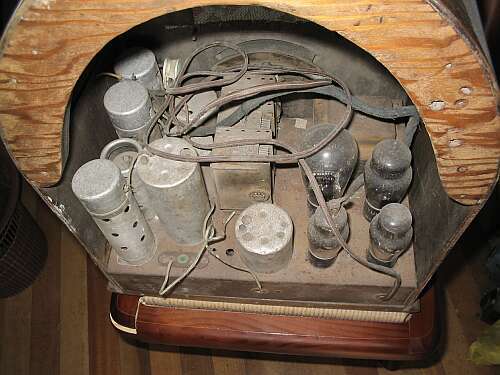 Here is a beautiful cathedral radio which is not yet restored, and for which I need information! The cabinet is veneered in mahogany, and has a stamped brass escutcheon with the unusual brand name Cosmos. 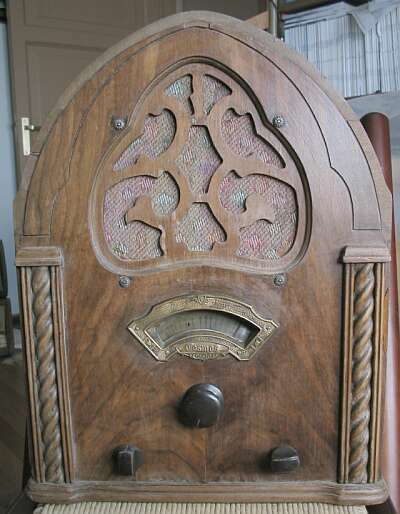 This radio seems to have been made by a certain Cosmos Electric Company, from New York city, but I have not yet been able to find any additional information on this beast! Needless to say, if you know anything about it, please tell me! My address is . The knobs are not original, of course. I would love to know how the original ones looked. The chassis fits the cabinet tightly. It is heavily rusted, but there are signs that originally it was plated, apparently with nickel. There is very little of the plating still in place. The speaker is a Rola, made in Cleveland, Ohio, with field coil and onboard transformer. It is connected with three wires, which is the minimum possible for a speaker of this kind. The radio has eight tubes, of the 2.5 Volt series. The tubes are 58-56-58-58-2A6-76-47-80. It seems to be a primitive superheterodyne with RF stage and separate oscillator, and I would date it to maybe 1931 to 1933. The radio covers just the standard broadcast band. There is no band switch. I have yet to find out how the coils are arranged. There are two equal looking RF coils, plus two more coils, and that's all. The last two coils are of very different height. I miss either the second IF coil, or the oscillator coil! Either something is missing in this set, or it might not be a superheterodyne after all! If some reader provides more information, great! If not, in time I will do some investigative archeology and find out what's the true situation. From the top, the chassis looks quite well made but heavily attacked by time. The dial mechanism is extremely simple but decently made. 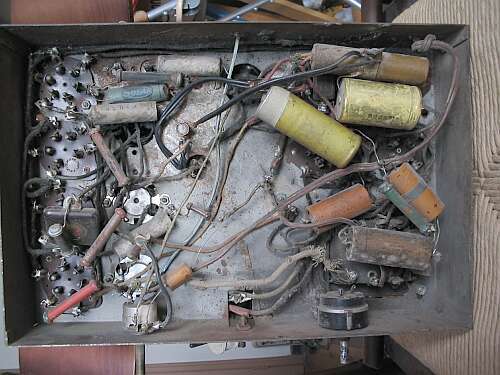 The set has a transformer supply, and all filter capacitors are under the chassis. Under the chassis, this radio does not look very good. It's haphazardly built, and it has suffered many modifications, apparently including some "simplifications" which left it with missing parts. The tone control isn't connected at all, the volume control is not the original one. Many components have been replaced - obviously whoever did the poor cabinet repair also did a poor job getting the radio to play. Interestingly, the chassis has no folded tabs to take the screws that fix it in the cabinet. Rather, it is held in place by long bolts, which run through the entire chassis and have nuts on top of it. All components that look original are American-made. This is the only hint at the radio's origin. There is no label or plate anywhere, neither on the chassis nor the cabinet. Probably the earlier "restorer" removed them. The tube complement is similar to some Zeniths. 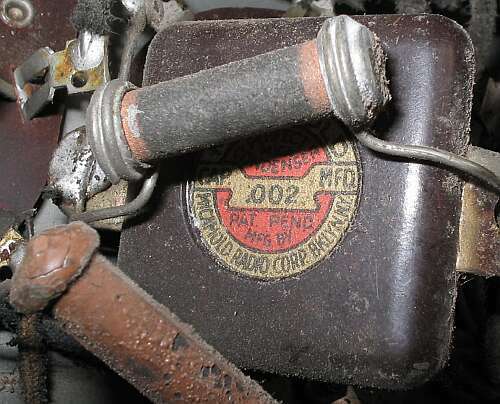 The variable capacitor has no brand name nor other printing at all, but several other parts bear labels indicating their origin in New York or near that city. 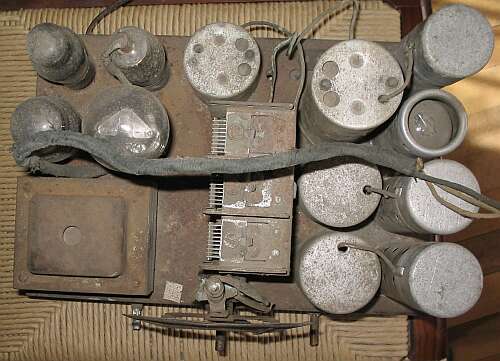 The transformer has only a 220V primary winding, so either the radio was made in the USA for export only, or the transformer was rewound here in Chile. If you have any information, such as model number, a schematic, or a picture that shows the original finish and knobs, please tell me!